What are the existing hydrogeological connections in the karst network? What are the transfert velocities of groundwater flows? What are the main features of the flow media? Are the flow connections depending on the hydrological conditions? Uranine injectection in the underground river of the Lorette cave (photo : G.Rochez). 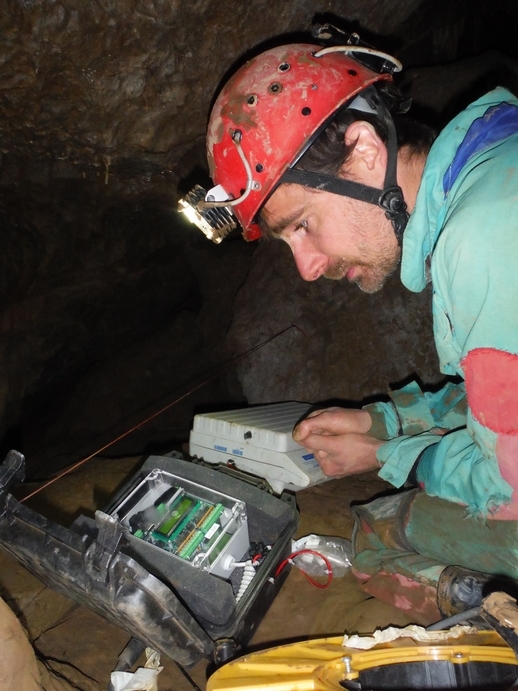 Initialization of the fluorometer data loger (photo : SC. Cascade). 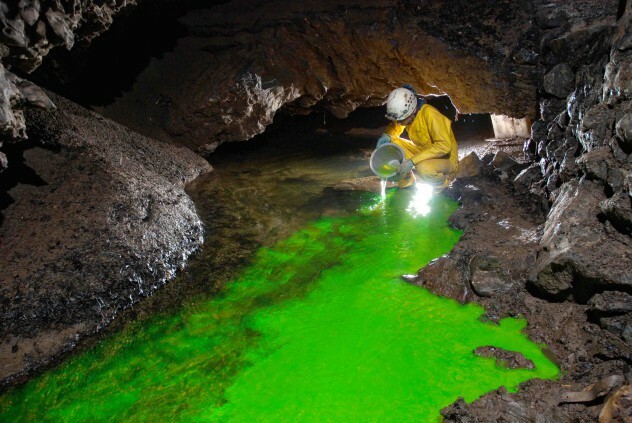 A tracer test consists of an injection of a tracing substance at one point of the karst system (sinkhole, underground river…) and recording the restitution of this tracer at another downstream point (exurgence, another underground river…). For the measurement, an automatic field fluorometer is used (Schnegg, 2002). This portable device allows the detection and the quantification of florescent dye tracers. Using multiple field fluorometers during the same test is useful to covers the maximum of the restitution sites. For the KARAG project, five field fluorometers are used during each tracer test, measuring the tracer concentration in water with a timestep of 5 to 15 minutes. In addition, data from a permanent fluorometerer installed in the Eprave resurgence are also available (monitoring : P. Meus and ISSeP). The repetition of tracer tests for variable conditions (hydrologic, injections and measurement sites) allows to understand the hydrogeological organization of the karst system and the water transport features. 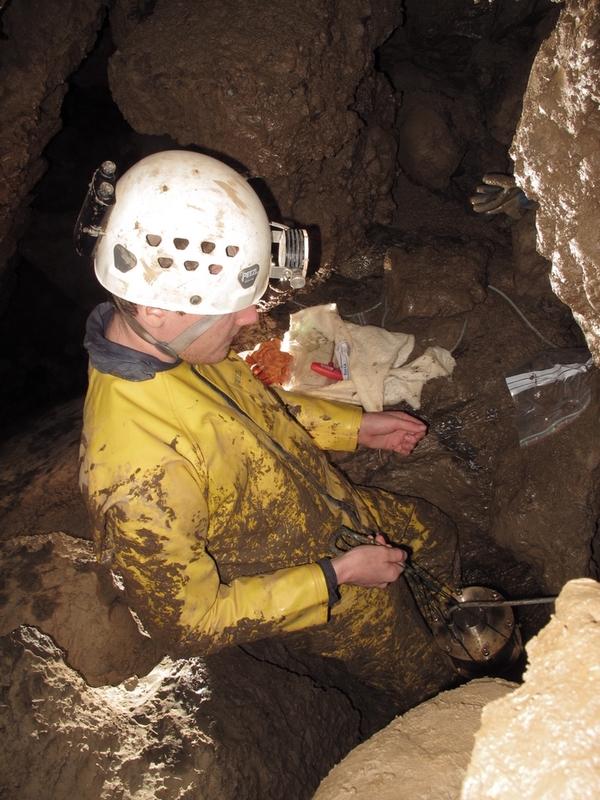 This is a key step in order to study the karst aquifer dynamic in this area. 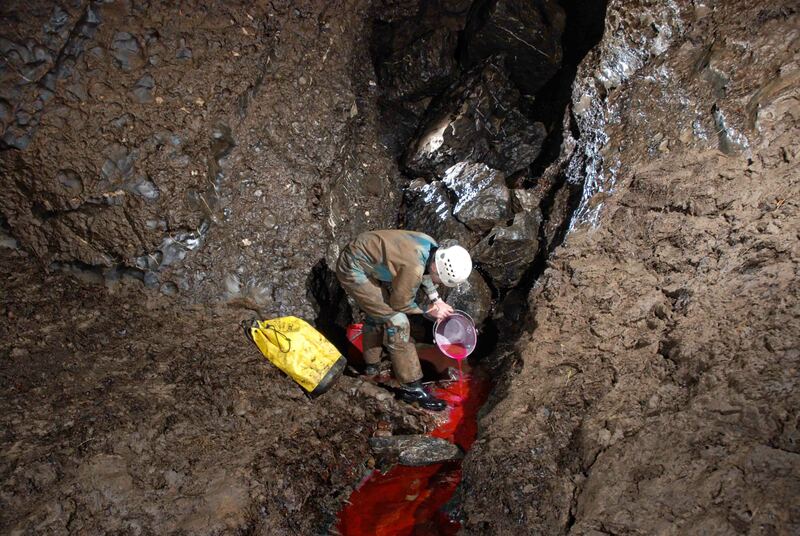 Injection of sulphorhodamine B in the underground river or the Pré au Tonneau cave (photo : G.Rochez). Référence : Schnegg, P.-A. (2002) – An inexpensive field fluorometer for hydrogeological traver tests with three tracers and turbidity peasurement. Groundwater and Human Development (Eds. : Bocanegra, E., Martinez, D., and Massone, H.,). 1484-1488.